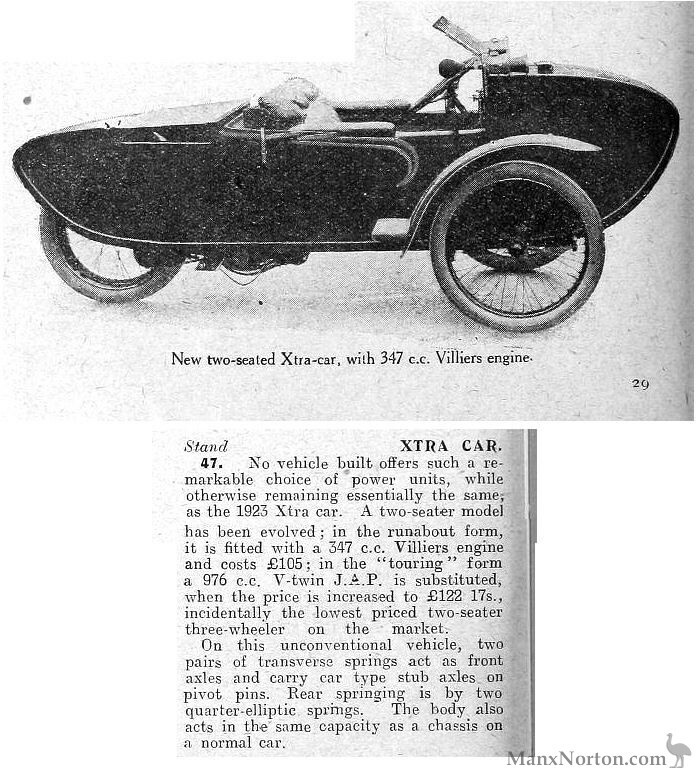 No vehicle built offers such a remarkable choice of power units, while otherwise remaining essentially the same as the 1923 Xtra car. A two-seater model has been evolved; in the runabout form, it is fitted with a 347 c.c. Villiers engine and costs £105; in the "touring" form a 976 c.c. V-twin J. A. P. is substituted, when the price is increased to £122 17s., incidentally the lowest priced two-seater three-wheeler on the market. On this unconventional vehicle, two pairs of transverse springs act as front axles and carry car type stub axles on pivot pins. Rear springing is by two quarter-elliptic springs. The body also acts in the same capacity as a chassis on a normal car.